Pontiac’s 1955 Star Chief convertible was the upper-crustiest offering from Flint, and though it wasn’t exactly a performance machine — remember, Bunkie Knudsen and the “wide track” days were still in the future — it was a great-looking car. Sunstar thinks so, too, and this isn’t this mold set’s first time at the rodeo. By our count, there have been more than 10 iterations, including a special I Love Lucy version with resincast figures of Lucy, Desi, Fred, and Ethel, as seen in the “California, Here We Come” episode. If that’s a little too past tense for you, consider this: given the palette of colors and two-tone combinations available in ’55, and the different body styles that Sunstar will offer — hardtop, top-down ragtop, and closed convertible — there’s plenty of life left in this old Poncho’s bones. And that’s good news; Sunstar’s gotten everything right, from the browed headlights to the stylized “V8” badges on the car’s nascent tailfins. Everything opens on real-aspect hinges, including spring-and-scissor units under the hood. The first-year OHV 287 V8 is all there, and it’s got enough detailing and markings to keep fans of “mint”-level replicas entertained. 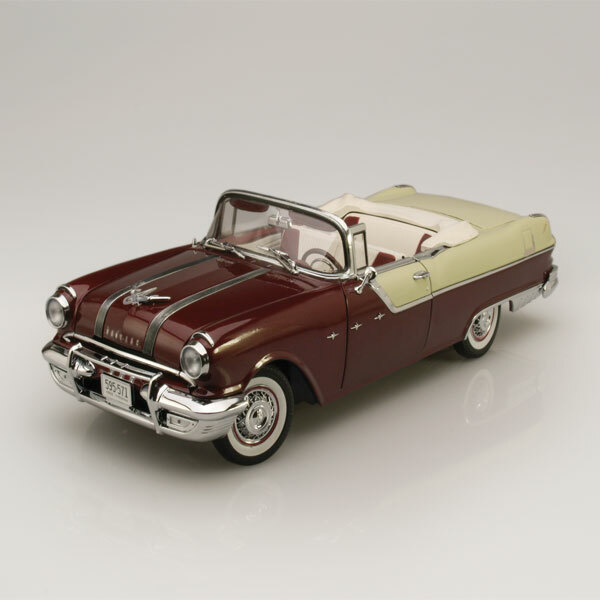 This pre-production sample’s Persian Maroon and Avalon Yellow paint contrast beautifully with the white boot and seat tops, and at the end of each spring-loaded axle, the wire wheel covers and whitewall tires set the whole thing off perfectly. Sunstar always gets these all-important notes right in its top-shelf “Platinum Collection,” but somehow, the clear and red lenses look even prettier and more authentic than usual on this one. Keep ’em coming, guys. — Joe Kelly, Jr.